This will be a short piece hopefully giving a bit of an insight into the notorious race of creatures known as 'eBay snipers', and how to try and protect yourself again them. It should also give you some ideas as to what information you can derive from what eBay provides you, and how to interpret what you see. I recently participated in an auction that I had a strong vested interest in winning, and so I was exceedingly nervous about how best to win this. With less that 24 hours to go there were no bids, and having lost an auction recently due to last minute bidding I didn't want to lose again. So I restrained from bidding, and watched, and lurked, and waited for the bidding opportunity to present itself. So ask yourself - what does this tell you about Bidder #1? Let's go through a list. The Last Bid column tells us about the timing of bidders. Do they bid in advance? Or do they come in at the last minute? In this case we see a large range of times. Remember here that the lowest time that eBay will specify is < 1h, so it won't tell you if a bidder is likely to come in at the last second. But you can usually infer this anyway. In this case, we see that Bidder #1 is generally pretty good at indicating their bids, and doesn't tend to snipe. However, if we now consider the bids that they've won, we can see that it is possible that they are a sniper (if they really want to win), since half of the items they've won were last bid on in the final hour of the auction. This makes them a risk. This is supported by the fact that they have a fair few auctions where their last bid was in the final hour, even if they didn't win. You can also infer their dedication to the item based on their general bidding Category. Bidder #1 seems to be quite a fan of antique furniture and decoration, which means that they are probably quite experienced in this area and possibly know the worth of items fairly well. To put it in context of the specific item we were bidding on, it was a wooden cabinet - from their history we can see that they've been after a cabinet for a while and have not yet won one. It is likely that the cabinet is intended to store other items they have bid on, such as crystal, pottery, statues and porcelain. 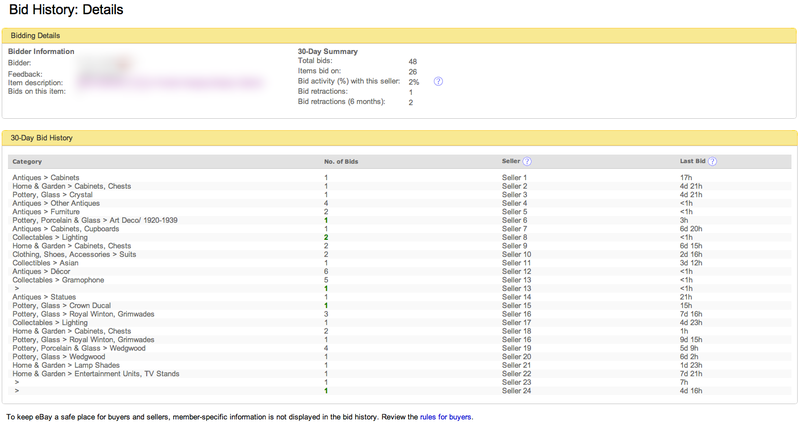 We can also look at their feedback, and see that Bidder #1 is quite active on eBay with over 1800 sales/purchases. We can't see more detail, but it's clear that they buy a lot on eBay. I would be careful of this bidder based on the fact that they have had 1 bid retraction in the last 30 days and 2 bid retractions in the last 6 months.